Paris – I Can’t Be Sick! 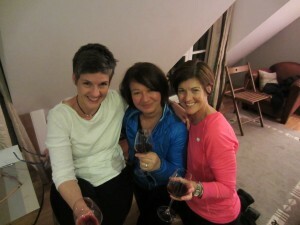 My Girlfriends Are Here! 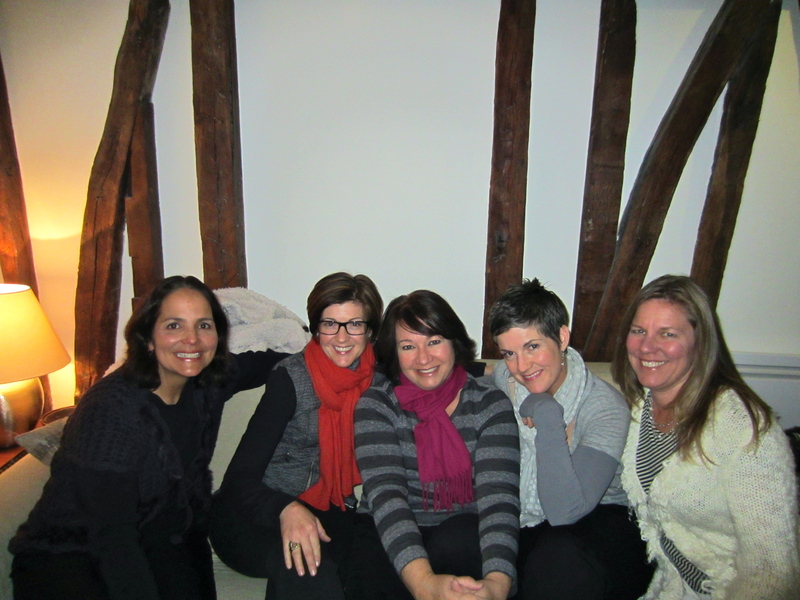 Back around December, Gigi put out an invitation for friends to come visit us when we would be in Paris for a week. Much to her delight, two different pairs of girlfriends, one pair from Los Angeles and the other from Redwood City, decided to take her up on the offer. We all arrived on the 21st. The first night, Debbie and Lynda crashed on the sofa bed in our tiny, 6th floor attic flat (Imagine Linguine’s apartment in Ratatouille) before moving into their own Hotel. 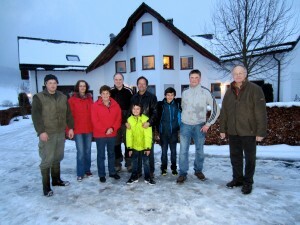 It was wonderful having them with us. The next day, we met up with Sheila and Shelly in a falafel restaurant in the Marais district. Justin was so excited to see Sheila. Sheila’s son Shane is Justin’s best friend. I think he really wants Sheila to take him home with her at the end of the week. 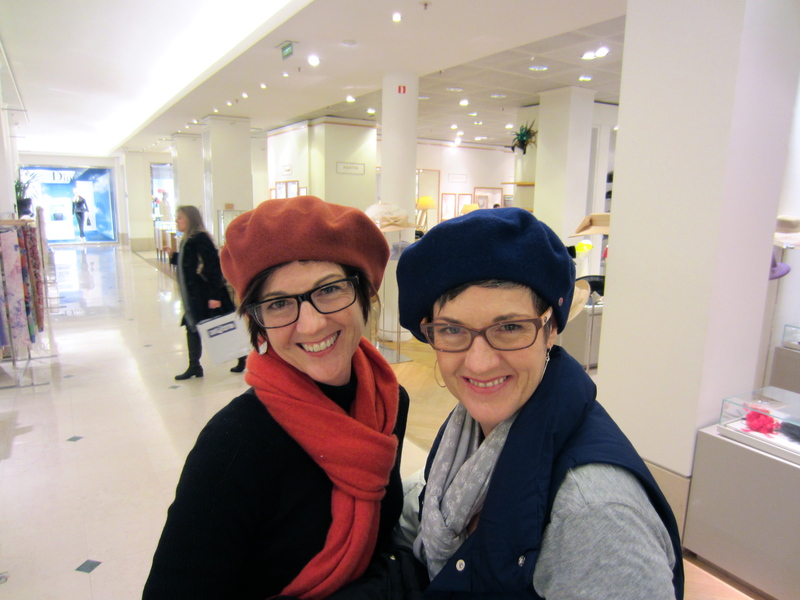 The day our arrival in Paris, Gigi began feeling congested. She and Justin have had many issues with allergies in all these new environments we have been sleeping in, and she was hoping it was just that. Unfortunately, it was not. 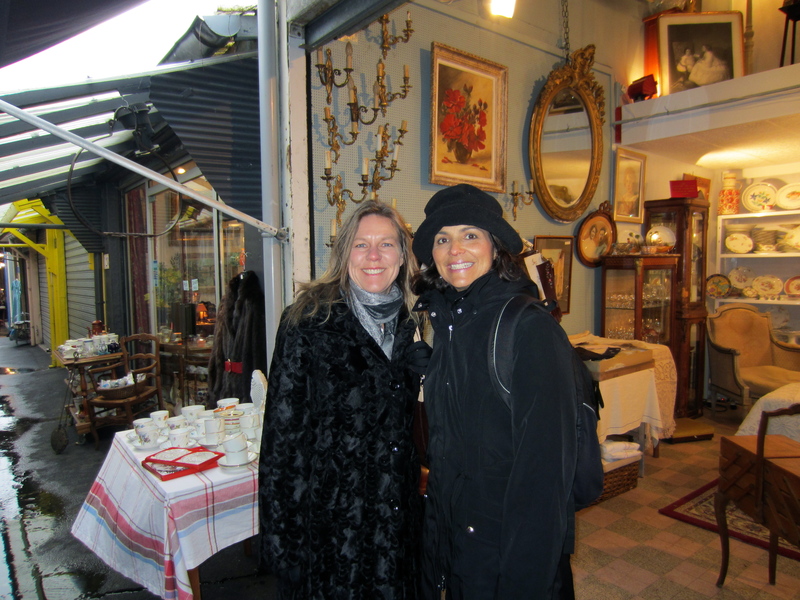 She sounded horrible on Friday and in spite of the freezing weather outside she did the walk to the Marais that day. Friday night she sounded awful. She was pounding vitamins and Vitamin C. Luckily, no fever developed and after a full days rest on Saturday it seemed her cold was abating. Gigi is getting some much deserved adult girlfriend time away from us. So far, she has had two dinners out with this troupe and gone antique browsing in Saint Ouen’s Marche des Puces with Sheila and Shelly. She still has two days with her girlfriends. 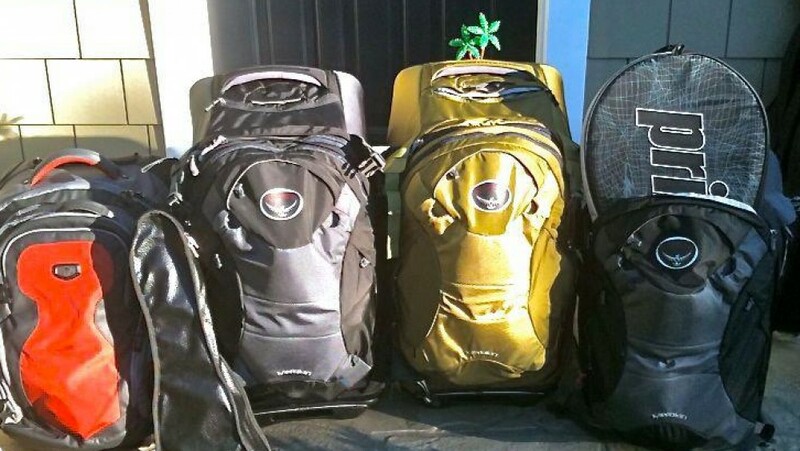 We all leave Paris on Thursday, they for California and us for London. 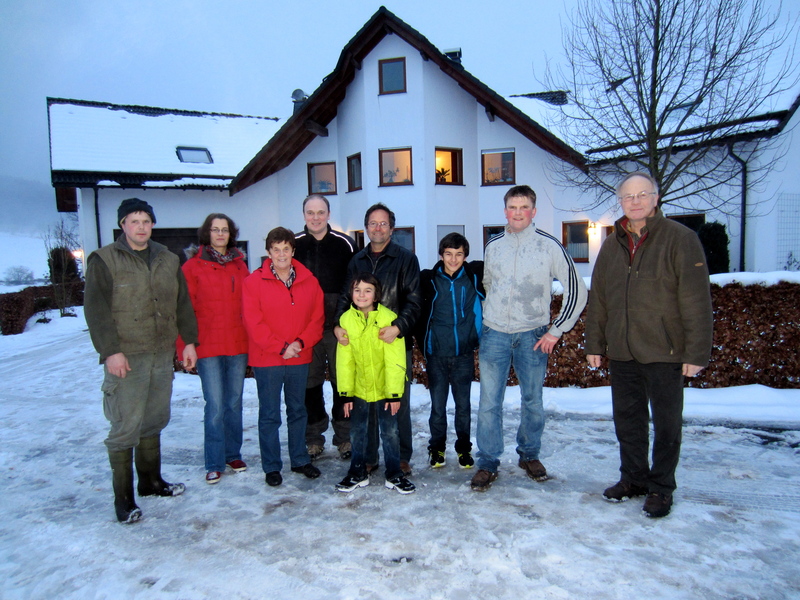 Our whole family has enjoyed having friends from California to talk to and spend time with. It feels like we have doubled the size of our family for a week. Such a short time! The weather continues to be poopy. Gigi is feeling better and was out today with her friends Sheila and Shelly roaming the antique arcades of Saint Ouen. 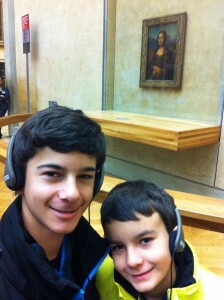 Today was definitely museum weather, so the boys and I took the 10 minute walk to the Louvre. The ticket line was not too long, but by the end both of them were starting to complain about standing so much. Argh! We had not even gotten into the museum. Sigh. 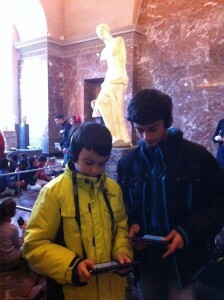 What saved the day were the Louvre-Nintendo 3DS XL audio guides. (I only rented devices for them, apparently I felt supremely confident that I already knew everything about the Louvre’s 35,000 items) These devices immediately engaged the boys. They became the navigators of the museum. Pick a piece and immediately get the route to it and estimated journey time. They listened to the explanations of the artwork. They manipulated statues displayed in 3 dimensions on the 3DS screen and zoomed in on paintings on their screens, all the while standing in front of the actual piece of art. We put a good dent in seeing what the Louvre had to offer – the Egyptian rooms, Italian art, giant French Republic period pieces, Greece and Roman sculpture. However, after 4 hours, probably a record time of sustained, non-Mind Craft focus for the boys, we packed it in and went back to the apartment. Tomorrow, the Musee d’Orsay. Today, I took Jordan out for the afternoon to hear ‘gypsy jazz.’ Gigi was resting, hoping to rally against the cold that is now dogging her. Justin stayed behind in the apartment with her. The weather continued to be poopy – around freezing with light snow flurries but nothing sticking on the ground. We headed out to Saint Ouen on the north side of the city where there is the ‘Marche des Puces’, and a jazz manouche club called Le Chope des Puces – Espace Django Rheinhardt. 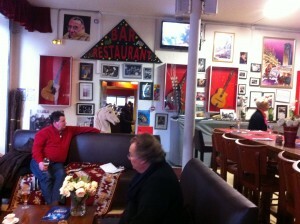 This is considered the epicenter of gypsy jazz in Paris. Open air markets and arcades of antique shops dominate the neighborhood. 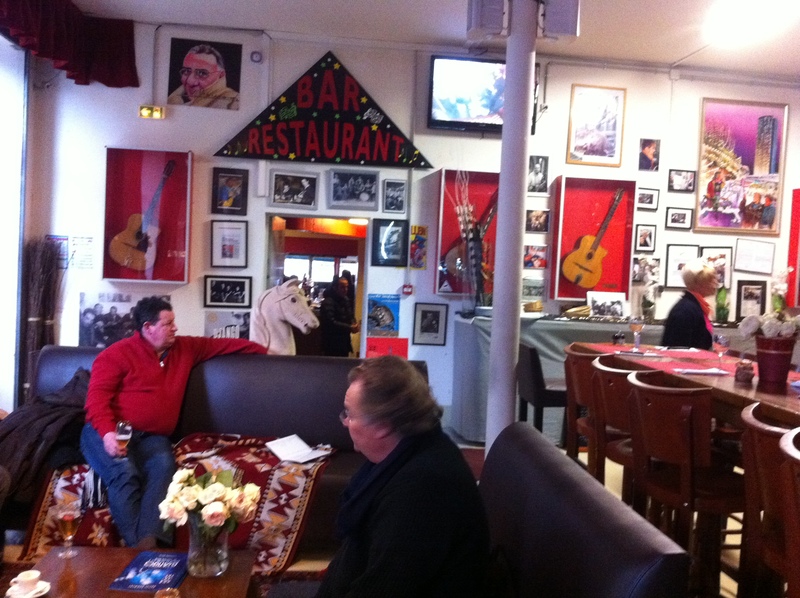 When we arrived, I was surprised to see just how small this jazz bar was. Two guitarists were pressed against the front window and behind the entrance door. There was a bar and 4 tables, and it was full. We had read that there was a restaurant behind in another room, which is where we headed. 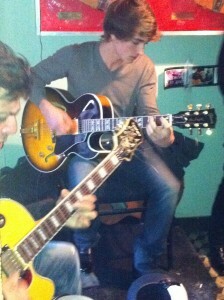 The room’s walls were covered with guitars in glass cases and jazz memorabilia; carousel horses were also present. The room was full with a music-seeking lunch crowd that did not match the motley crew of people outside in the street Marché. Jordan and I had an excellent lunch ordered off a chalkboard that already had many items erased. This kitchen was home cookin’; you got a meal that the chef was cooking up from seasonal and available ingredients. We could hear the music through the hallway and from speakers, and we could see the players on TV’s with closed-circuit cameras. For the past few months, we have been listening to 3 CD’s of gypsy jazz/gypsy swing that we bought on the street in Provence. Here, we were hearing the live version, and it was beautiful. I wonder if some day Jordan will be playing guitar like these players. 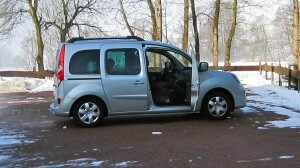 After 163 days or so and 14,023 kilometers, we have bid farewell to the Kangoo. The car was sturdy, roomy and decently comfortable. We received no traffic or parking tickets. We got around 800 kilometers to a tank of gas. It lacked power and the diesel exhaust really stank. These issues with the car were of our own making: putting gas in the tank instead of diesel, not having our credit card work in the toll road booth machine and the machine ‘eating’ our ticket, being in France and having to listen to the WORST radio stations on the planet while driving, pulling out of a parking place and hitting a tree, playing chicken with cars on narrow roads in rural France, trusting TomTom to be an infallible guide, scratching the back bumper two times, pulling out of an Italian gas station without paying and then spending an hour getting back to that gas station to pay, putting regular water in the wiper tank in Italy and having it freeze in the Alps and Germany, driving down a snow covered driveway without chains and having to get pulled back up with a tow rope. Not bad after 14,023 kilometers of driving. The drop off was easy. We left the car at the same place we picked it up in September. The Renault Eurodrive person was not in the least concerned what state the car was in, which is part of the fully-insured service. Just turn the keys in and sign a paper. Take the metro back to the apartment. This week we took a trip to a place from the past for dad. Thirty years ago, my dad signed up to go work on a farm in Germany. 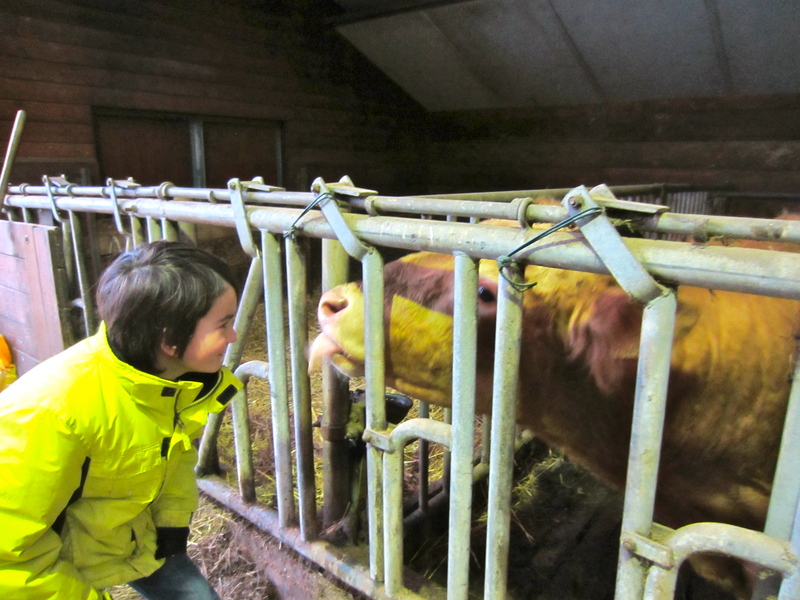 On our big drive north to Amsterdam he planned to stop by the farm for a visit. 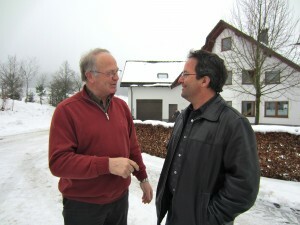 Dad sent an email (in German) to Joesef, the farm owner. After a great response it was final! We were to have lunch with them and their three kids (who had since grown considerably according to dad). Before we could even get on the road, dad had a little trouble driving up the driveway. There was just enough snow coating on the ground that was unfriendly to our non-winter tires. At first dad tried to hook chains to the wheels, but he had forgotten how to do them and Bernd insisted they were not necessary. So, with the help of some rope and a lot of horsepower, dad’s friend towed us up the short, steep part of the driveway with his 4-wheel drive truck. We got back on the road and followed them to the house farther up the hill. At the top we received a warm welcome from Joesef, Maria and their two other sons. We stayed outside a little while talking before the cold finally forced us in. We gathered around the living room, drank champagne and coke, (a small upgrade from beer and Fanta) talked, and relaxed before the cake was ready. 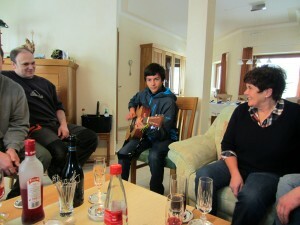 I played my guitar for them and received a great applause, although I admit I was a little nervous playing for people I had never met before. The cookies were great, but I didn’t try the cake because I am no fan of raspberries. I did hear though that the others loved it. After all the sweets were eaten, we went back outside to explore the farm space that had been built after dad had worked here. 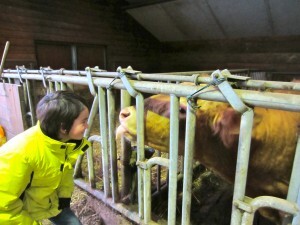 They still had a good dairy running with 30 cows and a bull and two new calves. 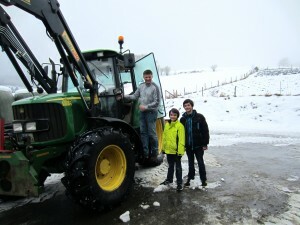 Bernd let us drive the tractor around everyone. 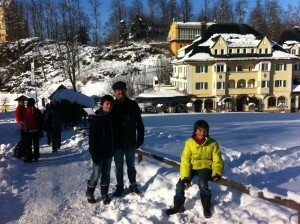 Justin and I had a snowball fight with Bernd, Christof and Reiner. I did not have my gloves and my hands were freezing. Mom got a lot pictures and we had a great time. Sadly, Joesef and Maria had an invitation to go to a friend’s house that evening, so we left a little early. Everyone said his or her goodbyes and we drove back to our hotel to get ready for the long drive to Amsterdam on the morning. 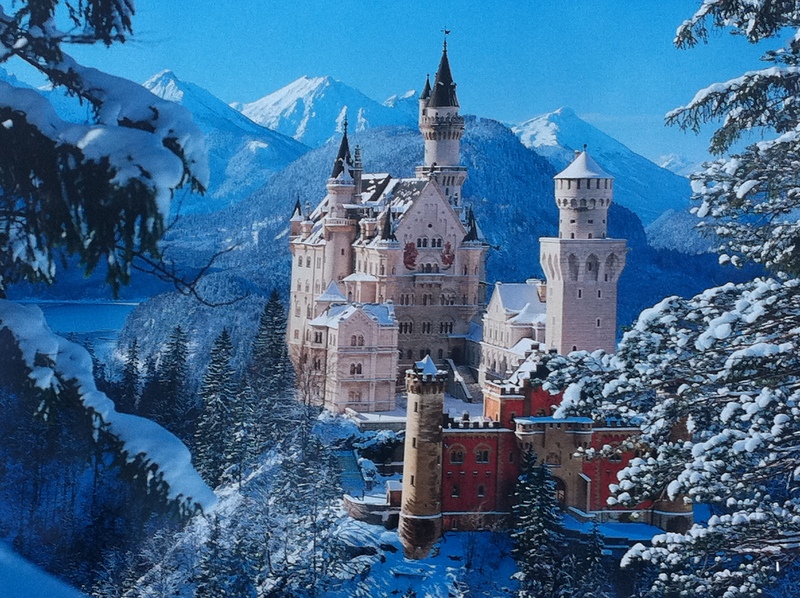 Germany had never figured prominently in any of our oft-revised travel plans. 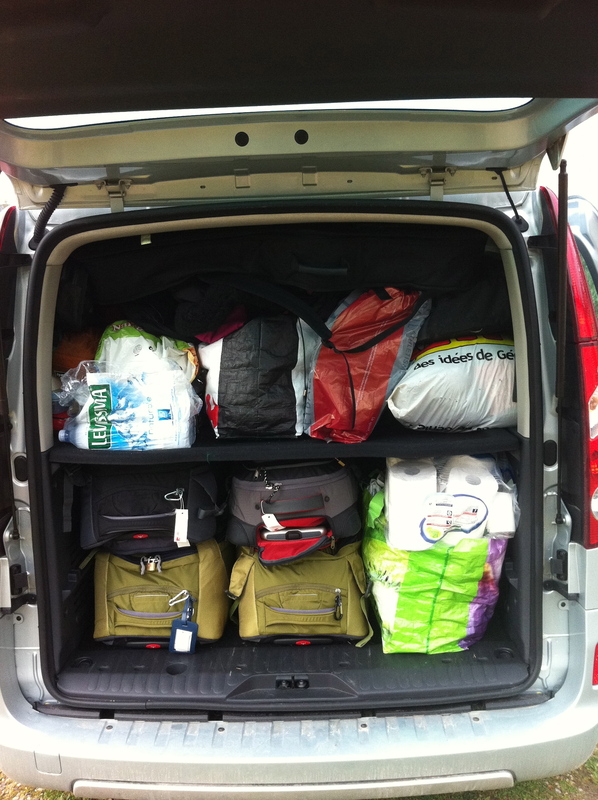 In the end, we ended up spending only 3 nights in Germany and were treating the country as a transit route with Amsterdam as our goal. We had very little time to do any sightseeing. I thought the ‘Disneyland Small World’ castle of Neuschwanstein would be a good first stop for a few hours. Gigi nor I had ever visited this castle. It is uber-picturesque. 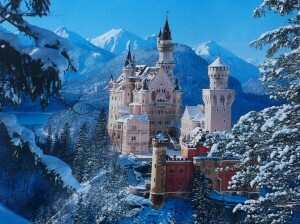 Neuschwanstein is located in Bavaria at the base of the Alps right on the German border with Austria. 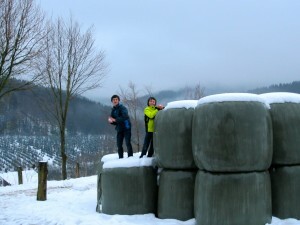 It had snowed two days earlier and Bavaria was blanketed under several inches of fresh, powdery snow. The skies were blue. We arrived at noon with just enough time to get lunch in one of the tourist hotels before taking the 40-minute walk up the hill to the castle and arrive in time for the 1:50 PM tour in English. As we drove into the small town of Hohenschwangau, we could see the castle standing on the hill, but the road up to it from the town ran under dense tree cover. Snowflakes were blowing off the tree branches and snow bombs were dropping periodically as we made our way up. We were surprised to see so many other tourists on a cold Thursday in January, but this castle is a major tourist destination. 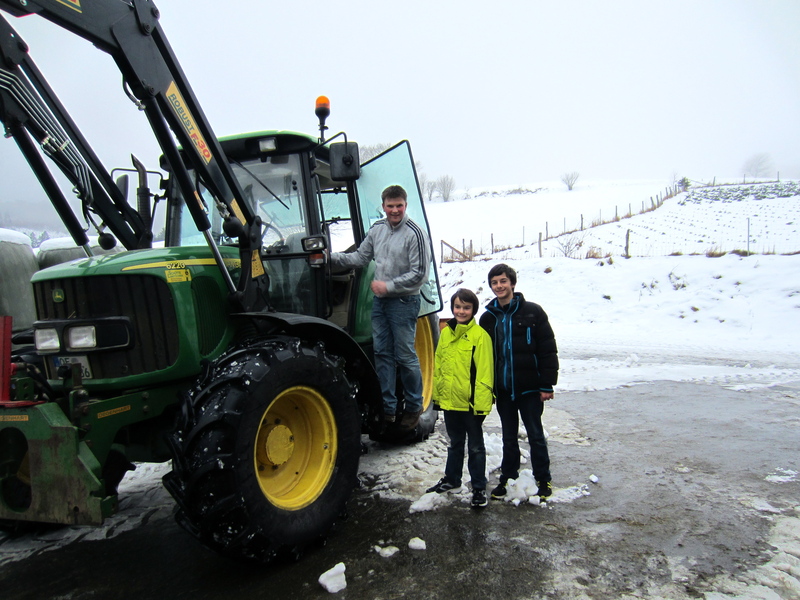 On the way up, the boys really wanted to just play in the snow, and my role was that of the spoiler. ‘Stay out of the snow!’ ‘If you get wet, you will be miserable!’ ‘No one else is throwing snowballs!’ I’m such a buzz-kill. They would have been happier if Gigi and I had left them outside to play in the snow. After the 35 minute tour and the 20 minute hike back down the hill, we were back on the road heading north. The town of Fussen, close by Neuschwanstein, looked very pretty and would have been worth a stroll through, but it was getting late, it was cold, and the boys were done with strolling for the day, especially if they could not throw snowballs at each other. Innsbruck – I smell sushi! 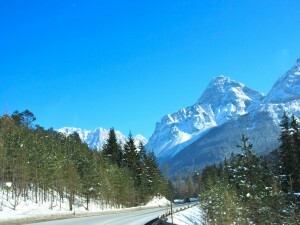 We finished a long day’s worth of driving from Lucca, Italy to Innsbruck, Austria. 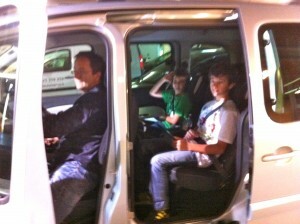 This began a leg of our trip where we would be doing a lot of driving and staying in hotels until we got to Amsterdam. 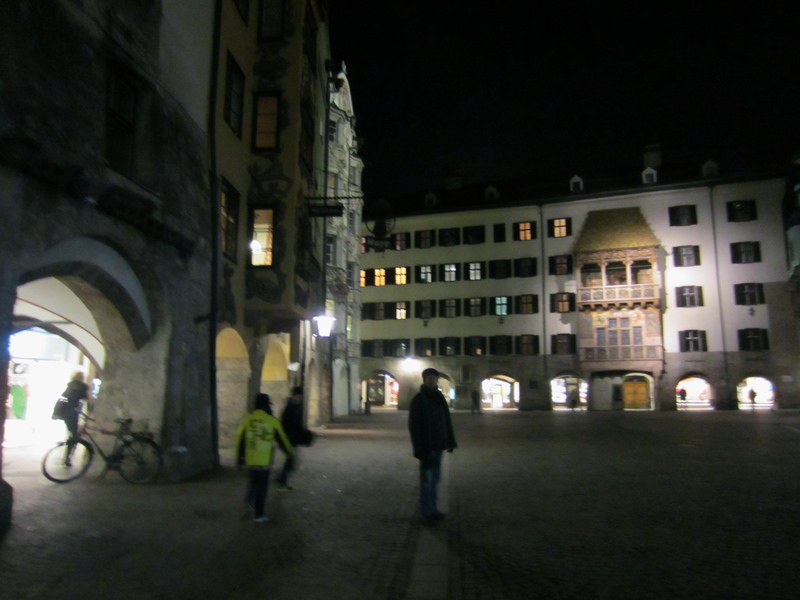 Innsbruck was cold, around -5C in the evening. 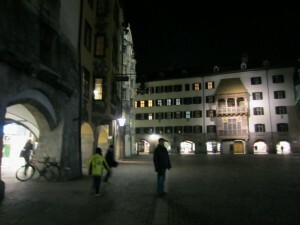 Still, we took the 20-minute walk from our hotel into the old town center to find a restaurant for dinner. The entire way in Justin was demanding that we eat sushi. I thought, “Hey, were in Innsbruck, no way we will find a sushi restaurant.” In France they use pigs and dogs to find the hidden fungus called truffles. To find sushi anywhere in the world, we have Justin. We were wandering the old town, and sure enough he spots a sign for a sushi restaurant. The vote was 3-1 to eat Japanese that night. I was the ‘no’ vote. The restaurant was Korean-Japanese, and I continued my protest against Japanese food by ordering a Korean dish. All were happy with the meal. We left first thing the next morning. Not much to our layover in Innsbruck. The drive out, however, was spectacular. 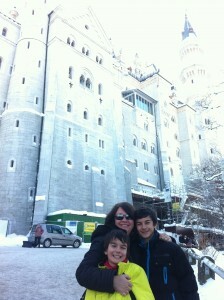 We had blue skies and a fresh coating of snow on the land as we headed for Neuschwanstein in Germany. All molars on the right side. He has two more loose teeth. This is putting economic pressure on the tooth fairy as the euro to dollar exchange rate has been rising and is now 1.37. This morning, Gigi and I went looking for the weekly market in the town of Massa Lubrense before heading to Positano for a day trip. 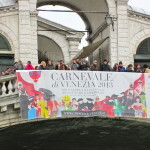 We knew it was in Piazza Francesca, but did not know exactly where the square was. Turns out it was not in the middle of town, as most weekly markets are. Twice we were given directions, but could not find it after an hour of searching. 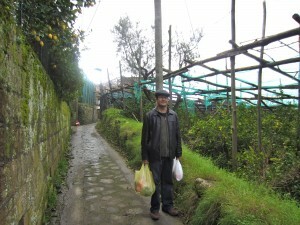 Our landlady offered to drive us to the market, only 5 minutes away, and then we could walk home. As is turned out, the market was by a church that is up on a hill on a dead end road. Only locals would be able to find this market. We were looking for food, and were surprised to see that 90% of the vendors were selling clothes and household items from vans with amazing canopies that unfolded from the van’s rooftop. It was like a mobile mall of cheap shoes, jeans, winter jackets and such. On the way home we walked down small paths through lemon orchards. The Sorrento area is famous for limoncello, and the local lemons have a protected agricultural designation. 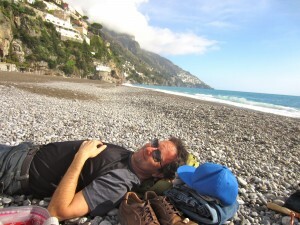 We packed up a picnic lunch and headed for Positano, 45 minutes away on the Amalfi coast. At one point we were on the ridge top of the peninsula and could look to one side and see the Amalfi coast, on the other side was the Bay of Naples. Clouds were brushing the limestone mountaintops above everything. Down the windy road to Positano. Traffic was nil, so the driving was easy, but slow, as this road is famous for being narrow and windy. 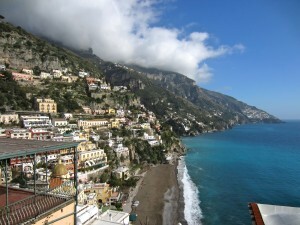 We parked at the very top of the town and walked down the ‘1,000 steps’ straight to the beach. There were maybe 10 other people on the whole beach. The sun was out, and even though it was only about 13C it felt warm enough for me take my shirt off and soak up the low winter sun. The boys stripped down to their underwear and jumped into the Mediterranean. 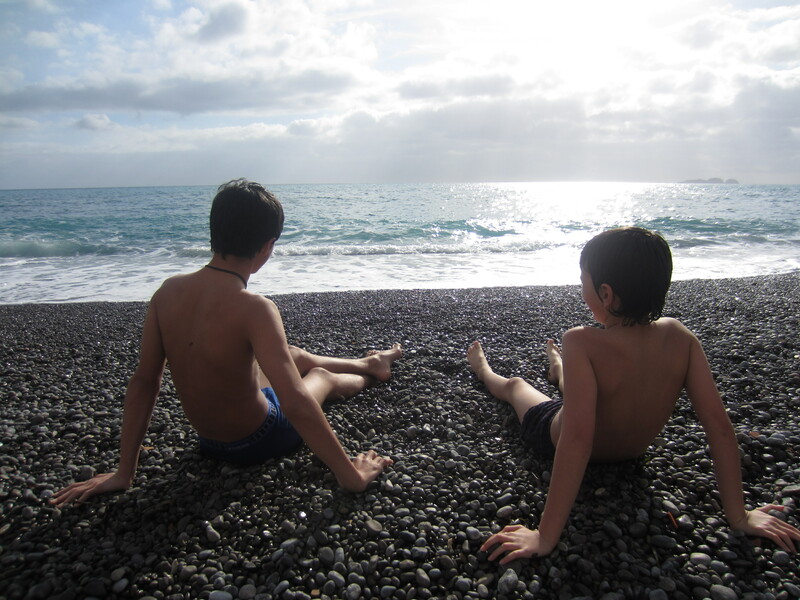 It was cold, but exhilarating, they jumped and shouted and laughed and very soon came out to sun on the pebbly beach. By 3 PM the sun disappeared behind clouds, and without it the beach became suddenly cold. We packed up and walked into the center of town and found it completely shuttered up, so we immediately found the town bus stop and took the bus back to the top of the town and got in our car and headed back to Massa Lubrense.